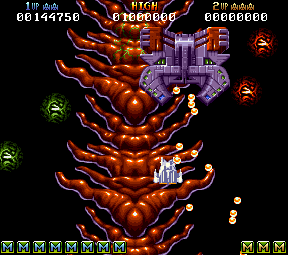 Martin Pedersen wrote two of the most technically impressive vertically scrolling shoot’em-ups ever released on the Amiga. Martin coded both games by himself, with Torben Larsen designing the graphics. 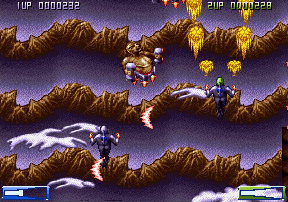 Both games pushed the boundaries of the Amiga hardware and featured stunning music and sound effects. 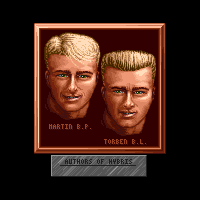 Martin met graphics artist Torben while writing the game The Vikings in 1985. 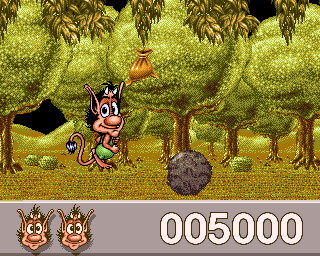 Martin programmed the Amstrad version, while Torben was working on the graphics for the C64 version. 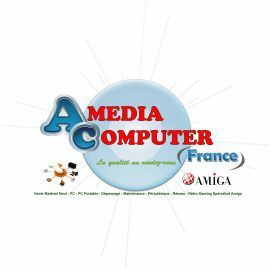 They felt limited with the Amstrad’s technical abilities, and decided to investigate the Amiga. After being impressed with what they saw, they decided to develop games for it. 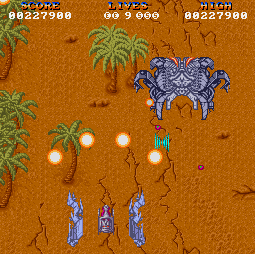 The game seems to have silky smooth 50Hz scrolling. Does the game ever drop a frame or were all the attack waves designed so it’s always a constant 50Hz? 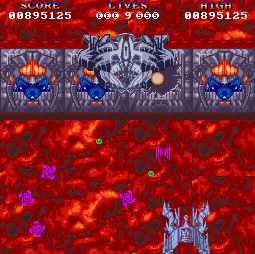 The biggest effort on the sprites was the score sprites “on top of everything”. The rest of the sprites are grouped in such a way that no problems occur in practice. 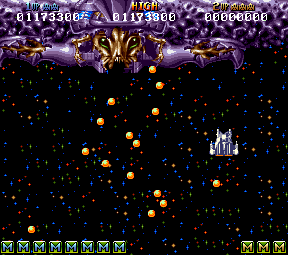 The score panel at the top of the screen uses a nice trick where sprites 0 and 1 have their sprite data set and are repositioned horizontally across the screen “racing the beam”. Did you come up with that effect or had you seen it in another game? Are there ever situations in the game where more than 8 sprites will be on the same line and hence an object will disappear? Or was everything carefully designed so that wouldn’t happen? 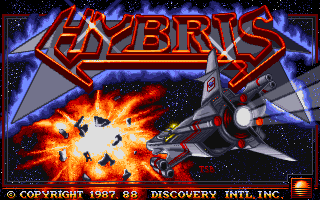 Was Hybris the most technically advanced shoot’em-up on the Amiga at that point in time? 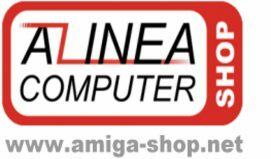 I personally didn’t own an Amiga when the game was released but can’t think of much before 1989 that was as technically advanced! What was the reason for making the display area 256×256 pixels? Was that more to match most of the arcade games at the time or was it done to enable more DMA time? 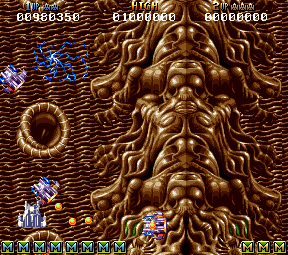 The main reason for having the black edges of the left and right was to give an arcade feel. 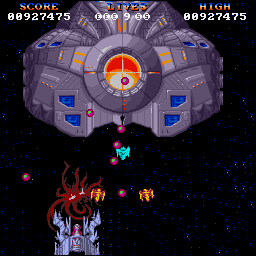 On many arcades the screen was turned 90 degrees to give the “tall effect”, which is highly suitable for shoot’em-ups. The attack waves on Hybris were quite interesting. First, I used a 32 bit longword to hold each of the x and y positions. The lowest 16 bits were the “decimals” and the higher 16 bits were the position in pixels. This made it easy to access the pixel position directly (only when moving the enemy were the “decimals” necessary). The wave movement is actually quite simple. There is both a “speed” that is added each frame, and then an “acceleration” that is added to the “speed”, also each frame. This continues for a certain number of frames, whereafter the next set of parameters are loaded. This is what gives the “wavy” movements. Each of the attack waves are initiated when a specific position on the level is reached. Yes, we did have a memory map for the game. I still have it on paper in handwriting 😉 It was however not defined from the beginning. At one point when we needed sound FX and music we made room for that and we did think a bit about it on the way and adjusted continuously. There was a “how to crack” tutorial posted on the internet in the early 1990’s and it specifically mentioned Hybris as a difficult game to crack because it purposefully used up as much memory as possible (of the 512k available at the time!). Was there any attempt to use all memory possible to make it hard or was it simply that all the graphics and sound in the game took up a lot of space? How accurate were the self-portraits in the Hybris attract sequence? Ciáran Brennan in his review for The One magazine stated that “those couldn’t possibly look like the authors!” Your response? 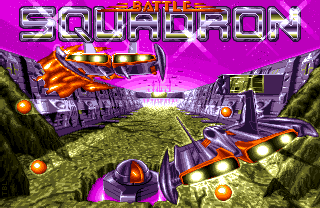 In the intro it sounds like it’s speaking “Welcome to Battle Squadron” – is that actually a (very small?) speech sample or is your brain filling in the speech guessing that’s what it’s saying? 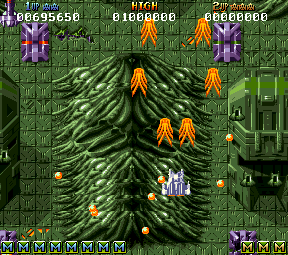 The Predator effect was amazing, yet I can’t think of another game on the Amiga that used it! Do you know of any other games that copied your effect? It seems to be one of the most widely remarked upon things in the game! For those of us that aren’t programmers, can you describe the overall steps that are going on every 50th of a second? (eg. 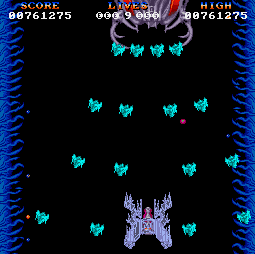 read joystick, move all baddies, sort them into Y coordinate order, restore backgrounds behind all blitted baddies, save backgrounds behind current positions, copy into copperlist etc). I’m not sure many people appreciate all the steps the programmer has to do the “old” way where you did not have the CPU power to redraw the entire screen every update like on modern hardware! Well, you describe it very well in your question already 🙂 I have put a small excerpt of the code below. I guess it’s pretty obvious what most of the calls do 😉 I had the “idea” to just use caps (for simplicity… maybe not wise after all…) and that all labels should be 6 letters (towards the end I had to extend to 7). The game doesn’t seem to be running via the vertical blank interrupt unlike Hybris! The VBL only kicks in when you fly between the top and bottom parts of the map and when you die. What was the reason for this? Was there some efficiency gain doing it this way or something? Now for a nice technical question! Do you have any idea how many raster lines the music routine took to play? How many of the Amiga’s 4 sound channels did you allocate for the music? There was a lot of things that required extensive tweaking to work. It’s a bit difficulty to say if they were actually difficult, or just time consuming. Bugs were almost always a pain to figure out. 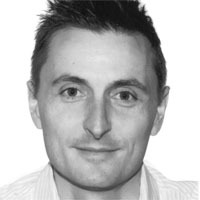 Since we already were in contact with Innerprise it was much easier than with Hybris, but actually Hybris had not really been difficulty to “sell” either. Did you have regular meetings with the publisher or sent discs in the mail, modem’d files and phone calls etc? I’ve only seen brief bits and pieces on the internet but it looks like it was a beat’em-up to start with rather than a space-shooter. What was the reason for that? Later in the BS2 rolling demo on the Cope-Com site there’s some mega weapons though! 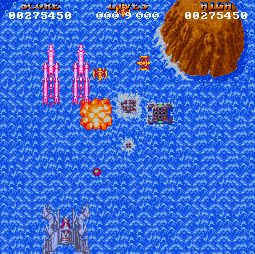 Like you said, it was actually both a shoot’em-up and beat’em-up. We were trying to come up with something new. By “punching” the enemies you could conserve their “power”, which could then be picked up. This would be destroyed if you blasted them. It was to have a bit of strategy in the game. Can you give any specifics about what happened to the game and why it wasn’t finished? Denmark is a small country so the Amiga community in Copenhagen was relatively small. Torben got in contact with these guys so that’s how it started. It’s a bit far back now, but I think it took some months. I heard somewhere it was used as a telephone game so people could play it online on a kids TV show – is that correct? Were there any problems or technical challenges with the game, having to adapt your code to fit whatever the main “shell” of the game used or were they all pretty much standalone levels? It was indeed many years before the internet… something I have often “laughed” about 😉 No, there was not really anything like that. Of course I would hear from time to time how people loved the games, and still to this day. But definitely that is clearer now with the Internet and e-mail. Also, we did not promote Cope-Com much at the time, as much as other companies would promote their brand. 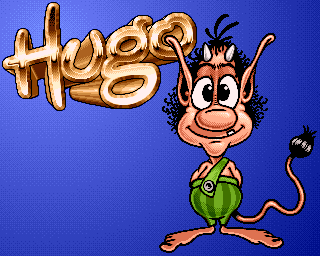 Are you aware of the amazing program WHDLoad that enables you to play almost all the classic commercial games on a “modern” Amiga from hard drive? I have been out of the business too long to keep up with these kinds of things 😉 But I have played various games, including Battle Squadron, on WinUAE. What do you think of the many people out there that have collected, catalogued, scanned and preserved all the old games, magazine reviews and then created websites – infinitely more work than the publishers would ever do? 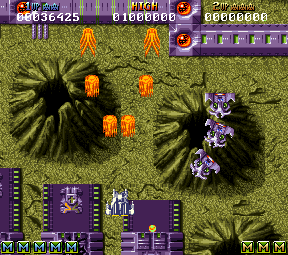 What are you up to these days besides converting Battle Squadron to iOS? Is that your ’employment’ or a purely a hobby? © 2011 Codetapper! 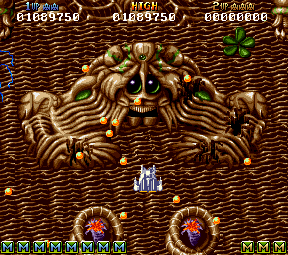 Some screenshots re-produced from the Hall of Light Amiga games database!